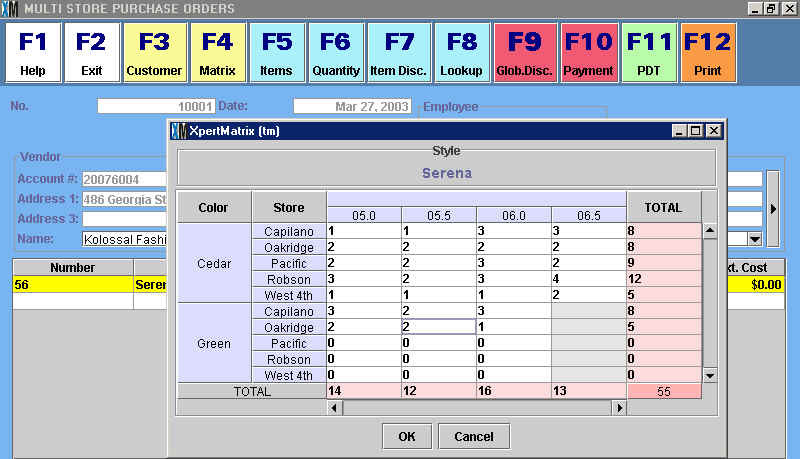 If you are using XpertMart™ to run more than one store, it might become useful to use Multi-Store Purchase Orders. Recall that normal Purchase Orders can only be made for one store at a time. However, there are several advantages to being able to make a Purchase Order for more than one store. To begin with, a Multi-Store Purchase Order is easier to make and can save you a lot of time. Another advantage is that you are able to see all of the items that you are ordering for your chain in one place. Because of the very nature of Multi-Store Purchase Orders, these can only be done at the Main. To make a Multi-Store Purchase Order, select this option from the Transactions Menu. You will notice that the Multi-Store Purchase Order screen is nearly identical to the Purchase Order screen. This chapter will deal only with the ways in which a Multi-Store Purchase Order is different than a Single Store Purchase Order. Make sure you have read the Purchase Orders topic before reading this chapter. Enter the desired quantities for each Size/Color/Store combination. You will notice subtotals for every Size and Color/Store as well as a Grand Total. In the example above, the user is ordering a total of 12 Size 5.5 Serena Sandals, and a Grand Total of 55 in all sizes and colors for every store. You can press <F4> as many times as you need to to modify the quantities being entered into the Multi-Store Purchase Order. If you add new items, these will appear. Likewise, if you reopen the matrix and delete items, these will be removed from the Multi-Store Purchase Order. Every time you close the matrix by pressing <F4>, the quantities in the Items Area will be updated. You can enter as many Styles into a Multi-Store Purchase Order as you need. You can modify the Order Costs that appear in the POrder Cost column. You can also enter any applicable item discounts and global discounts. Be aware that the costs and discounts you enter will be the same for all stores. If you need to have different costs and discounts per store, then you will have to make separate Purchase Orders for each store. When you are done entering items into the Multi-Store Purchase Order and press <F12>, a copy of the order will be saved in the Documents>Multi-Store Purchase Orders Catalog at the Main only. A Purchase Order for each store in the Multi-Store Purchase Order will be generated and synchronized out. Each of these Purchase Orders will have the items and quantities you entered for that store in the Multi-Store Purchase Order, as well as the appropriate Vendor, Costs, Item Discounts, Global Discounts, Delivery Date, Cancel Date, and Notes. Notice that every Multi-Store Purchase Order has its own document number. This number will appear in the Multi field of the Purchase Order. After the Remote stations have synchronized with the Main, the Purchase Order generated from the Multi-Store Purchase Order will be available to each store in the Documents>Purchase Orders Catalog. Each store will only be able to see those items and quantities pertaining to it and will not see those of other stores. Once a store or warehouse recieves via synchronization a Purchase Order that has been generate from a Multi-Store Purchase Order, that store can receive against it just as it would receive against any other Purchase Order. When you create a Receipt, you will be affecting the Received column of both the Purchase Order on file at the store/warehouse and the Multi-Store Purchase Order on file at the Main.